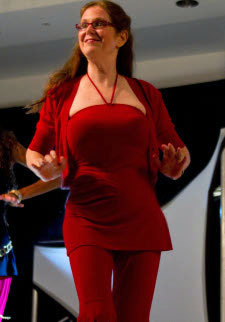 Dance instructor Barbara Bernstein has taught Salsa full time and directed DanceInTime for over seventeen years. Her classes are known for being friendly and welcoming to newcomers. Instruction is slow and patient with beginners; and experienced dancers are moved along at a good clip so they learn a great amount in each class. Barb loves to teach and holds a Ph.D. in Education with expertise in teaching methods. She is joined by other DanceInTime teachers who all share their experience, expertise and joy in dancing with the students! Come by, check us out, make new friends, and have loads of fun! First Saturday Class Free with this coupon. No partner needed! Drop-ins welcome! FLASHY & FUN LATIN DANCE SHOWS! Whether you are planning a private party, theater presentation or Hispanic Heritage celebration, DanceInTime can lead the show! DanceInTime has produced Latin dance programs for the Kennedy Center, the Verizon Center and the DC Convention Center, performed at special events in Miami, New York, Puerto Rico, San Francisco, and provided entertainment for local parties and festivals. Research confirms that dancing has tremendous physical and mental health benefits. Read about how music and movement improve well being here. Then come out and join the fun! Dancing Rueda in Havana, Cuba! Performance at a Wedding Reception at the Fountaine Bleue.